What Is Your Epic Win Today? We are living a broken reality starved for happiness, fiero (jubilant, fiery satisfaction and celebration), opportunities to experience success, engaged community and epic wins. So says, futurist and game designer, Jane McGonigal. “Reality is Broken”, Jane McGonigal’s impassioned, wonderfully detailed and thorough assessment of how games and gamers are changing reality is a glimpse of our future and our past. According to McGonigal and the gaming community, everything that is missing from reality is present in virtual and alternative realities for players, whenever and wherever they play. Who broke reality? It might be us. Life and games are all about context. “Level ups”, “power ups”, “missions”, and “epic wins” are core concepts and contexts in game language and design. The good news for some of us is that playing WoW (World of War craft) or Halo-3 is not a pre-requisite for reframing reality and bringing back the missing pieces. What we once referred to as our “personal best”, goal, or miracle (the radically improbable) is now “blissful productivity” and “epic win”. Reclassifying practices and empowering choices as “power ups”, skill enhancements as “level ups” and daily plans as “missions”, which quite frankly sounds a lot more interesting than a “to do” list, changes our context and our experience reality. Context changes how we consciously engage. According to McGonigal technology based games are powering up to help access our personal and collaborative potentials. We need this. We can begin shifting context today by defining our personal “missions” and the “epic wins” that deliver rewards of happiness, participation, fiero, engaged community, and the feeling we are all apart of more than we can know. And, most importantly in gaming tradition, we celebrate the experience. The inner game of consciousness comes first. There is an epic relationship between language and reality. Test it for yourself and see how you feel. Embodying the feeling of an “O.K.” outcome versus the “Epic Win” feeling is not comparable. The secret is making today’s “epic” an achievable stretch. A bombardment of messaging, subliminal and direct, that says we are not capable of “epic”, that we are hopelessly not enough, stuck in someone else’s story, and/or lack the power to repair reality is the enemy. Our mission is to eliminate that enemy wherever it hides. Think Michael Angelo and his awesome masterpiece, The David. Imagine the enemies and obstacles he met in the three years it took to sculpt this enduring message of wins and fiero moments. It is no accident that he chose David, the slayer of Goliath with one rock right between the giant’s eyes. That is epic. Today, there are other Goliaths, enemies and obstacles, lurking between our own eyes (our own perceptions) to slay. We do it every time we tune out the fear drones (opinions, news, predictions and prophesies) that drain our energy away from living the epic life that is ours. We do it every time we question and change the context of our own thoughts and actions. 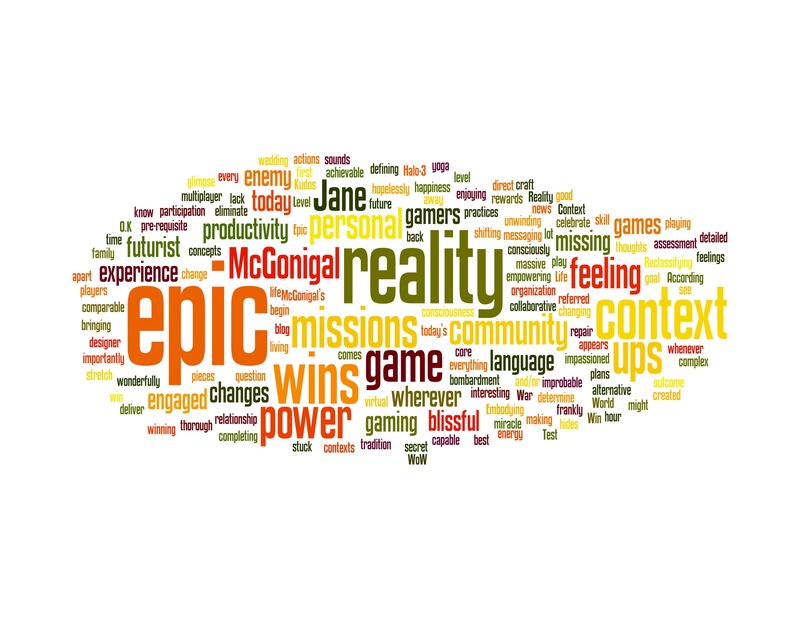 Kudos to futurist Jane McGonigal and gamers on personal and collaborative missions of “epic wins”. 3. If you don’t love “What You Do” – find a way to “Love How You Do It” – this technique is a big power up. 4. Notice when you are feeling “blissfully productive”, feel it fully and intend to bring more of this feeling into your life. Now is our time to create a new context.